This Sunday March 24, St. John's will welcome The Rt. Rev. Geralyn "Gerry" Wolf, Assistant Bishop of the Diocese of Long Island, who will preside at the 10 am service. The Rt. Rev. Geralyn "Gerry" Wolf was ordained in 1977 in the Diocese of Pennsylvania where she served two curacies before becoming the vicar of an inner-city parish in Philadelphia. 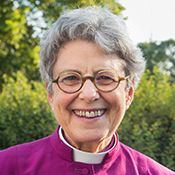 In 1987, she became the Dean of Christ Church Cathedral, Louisville, Kentucky, and oversaw the planning of an extensive renovation of the Cathedral. In 1995, she was elected the twelfth Bishop of the Diocese of Rhode Island, where she served for 17 years. Bishop Wolf was the liturgist for the House of Bishops when the Rt. Rev. Frank Griswold was the presiding bishop. Her work in this field had a strong impact on all her ministries. Bishop Wolf has done extensive work in urban ministry, especially with soup kitchens, thrift shops, and the homeless. Her book, Down and Out in Providence, was a result of spending thirty days as a homeless person. As a young adult she was a member of the United States Field Hockey team that represented our country in Argentina, and a locally ranked tennis player. Bishop Wolf and her husband, Tom Bair, retired in 2012, and moved to Manhattan in August of 2015. While in retirement, Bishop Wolf shares a small studio in Brooklyn where she makes whimsical characters and animals out of wood and found objects. Both she and Tom were born in New York; he in Utica, and she in Brooklyn.